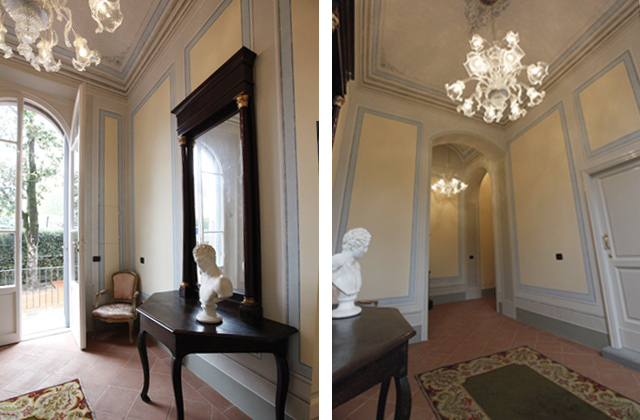 Villa La Fornacina differs from other accommodations usually found in Tuscany. And it also offers you a different kind of visit. The Villa and its annex are home to 10 large suites of between 30 and 55 m2, each one different from the others and some on two floors. All suites have a private bathroom, a kitchenette and a living area, in addition to the bedroom. The suites are characterized by elegant finishes, dating from the early 19th century, such as exposed wood beams, windows, doors, shutters, all carefully restored, original terracotta floors, bathrooms made of Carrara marble. This spacious layout allows you to live like in a real apartment, but with the typical charm of a suite. The selection of furnishings - Persian rugs, glass chandeliers from Murano and La Murrina, antique furniture, curtains and fine fabrics, such as silk and damask - goes hand in hand with the style of the Villa and makes each room a welcoming and prestigious place. The Villa has an outdoor garden and a terrace available to all guests, as well as a swimming pool that offers a place to relax in complete privacy.